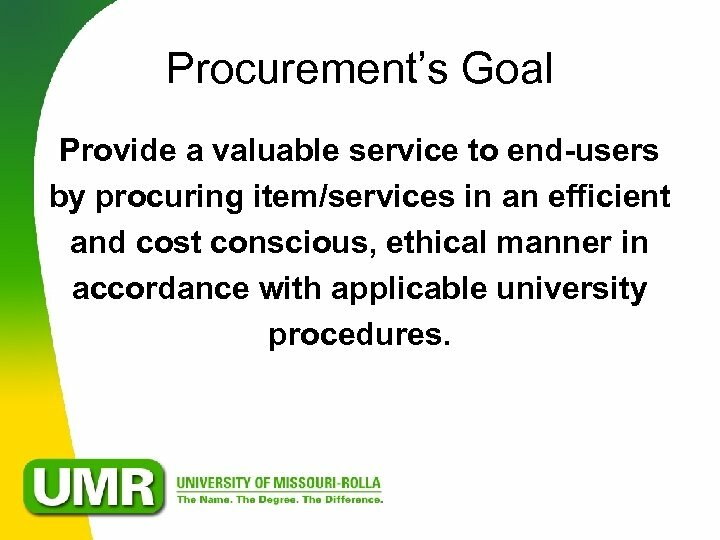 Procurement’s Goal Provide a valuable service to end-users by procuring item/services in an efficient and cost conscious, ethical manner in accordance with applicable university procedures. 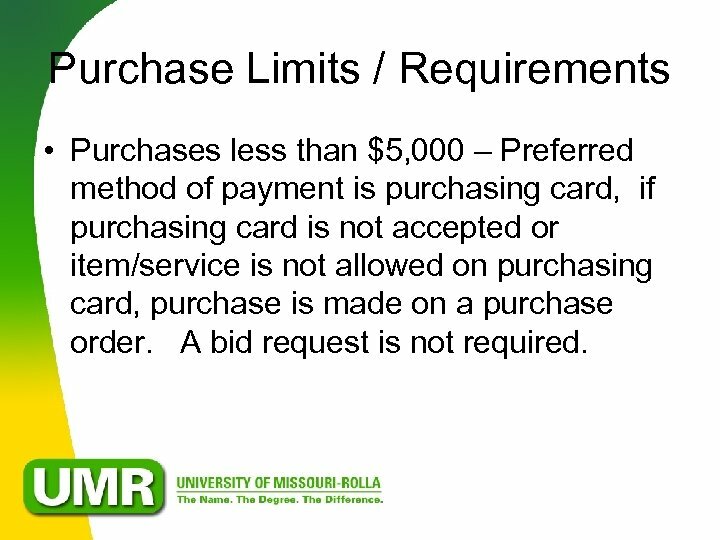 Purchase Limits / Requirements • Purchases less than $5, 000 – Preferred method of payment is purchasing card, if purchasing card is not accepted or item/service is not allowed on purchasing card, purchase is made on a purchase order. A bid request is not required. 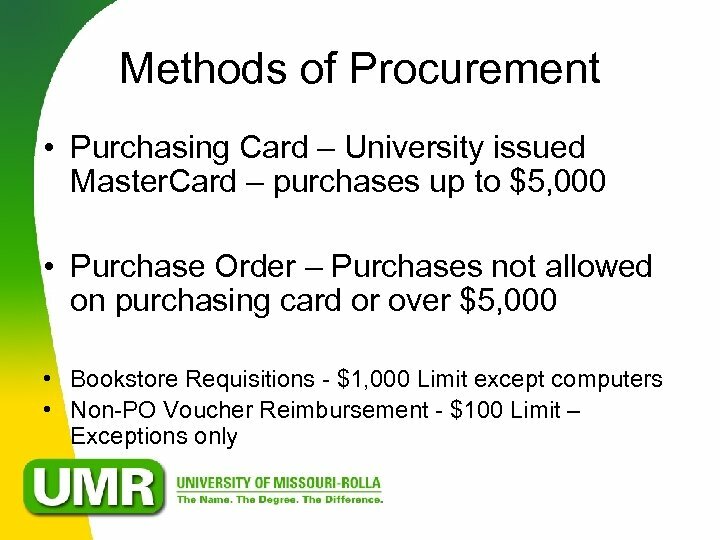 Purchase Limits / Requirements • Purchases between $5, 000 and $10, 000 – Purchase must be made on a purchase order. 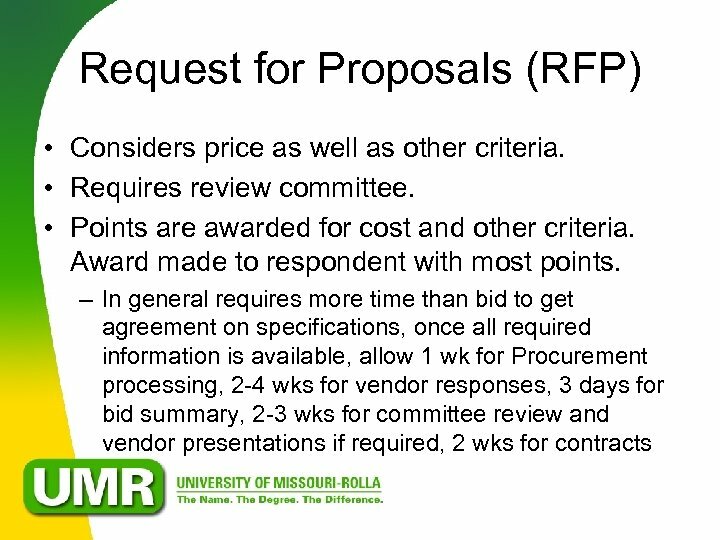 Procurement, together with the requesting department, decide whether it is in the university’s best interest to issue a bid request. 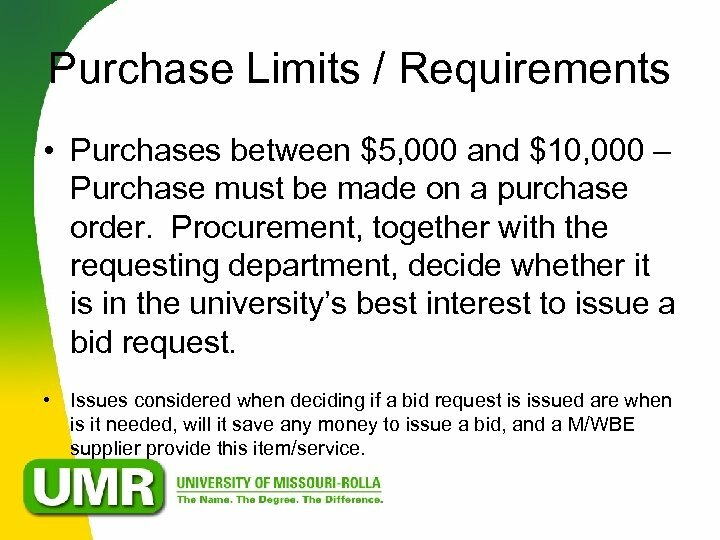 • Issues considered when deciding if a bid request is issued are when is it needed, will it save any money to issue a bid, and a M/WBE supplier provide this item/service. 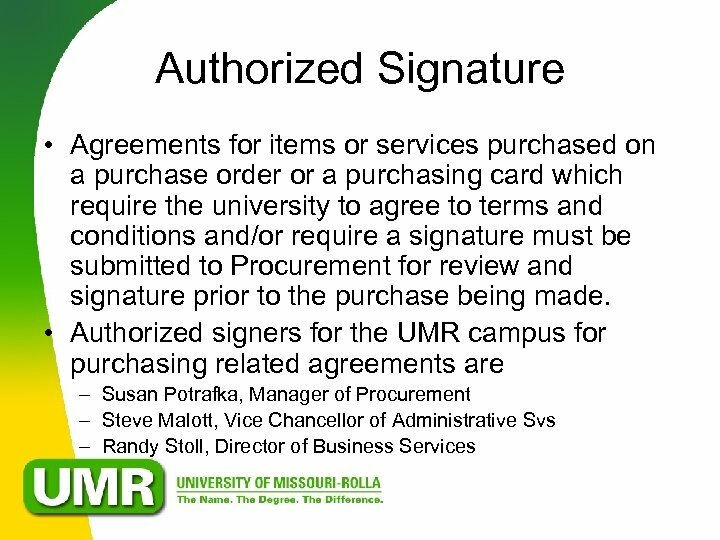 Purchase Limits / Requirements • Purchases which exceed $10, 000 must either be purchased from an existing university contract, be documented as a sole source, or require a request for bids / proposals be issued. 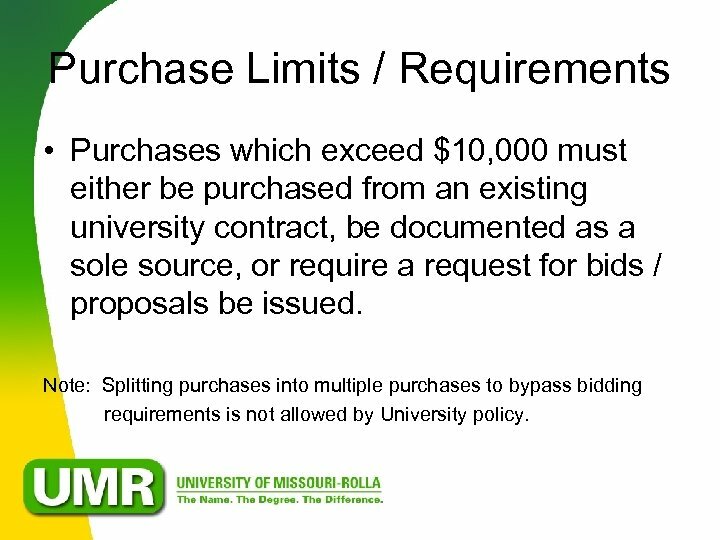 Note: Splitting purchases into multiple purchases to bypass bidding requirements is not allowed by University policy. 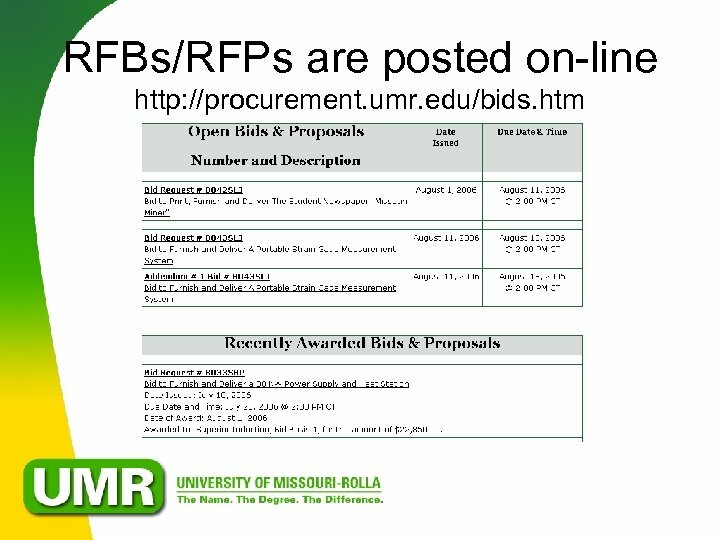 Request for Bids (RFB) • Lists minimum requirements. Award made to lowest priced bidder meeting all the minimum requirements. 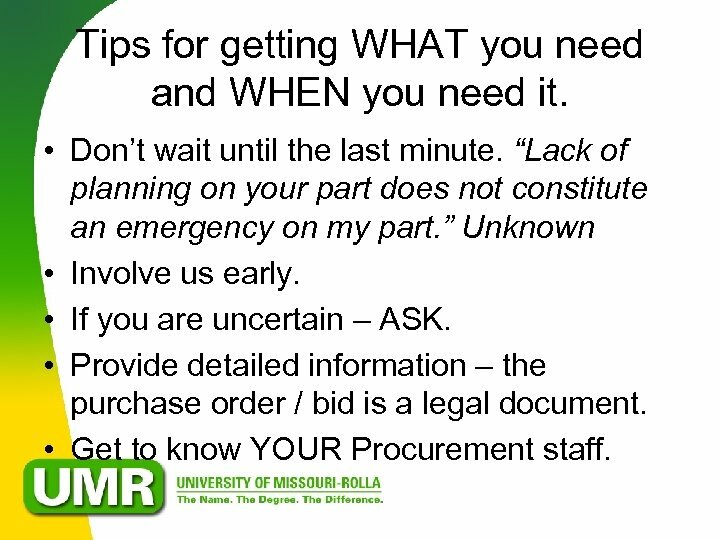 – In general - once all required information is available, allow 1 wk for Procurement processing, 2 wks for vendor responses, 1 day for bid summary – If Procurement workload is heavy, additional time may be required. – We try to process bids in the order they are received. 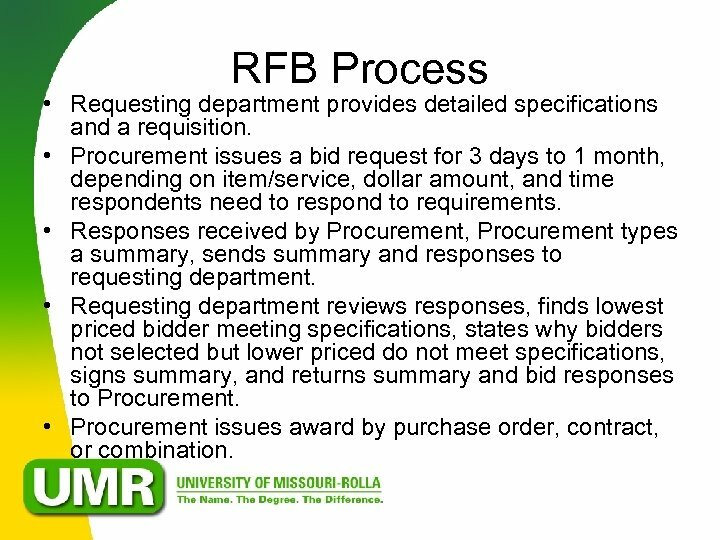 RFB Process • Requesting department provides detailed specifications and a requisition. 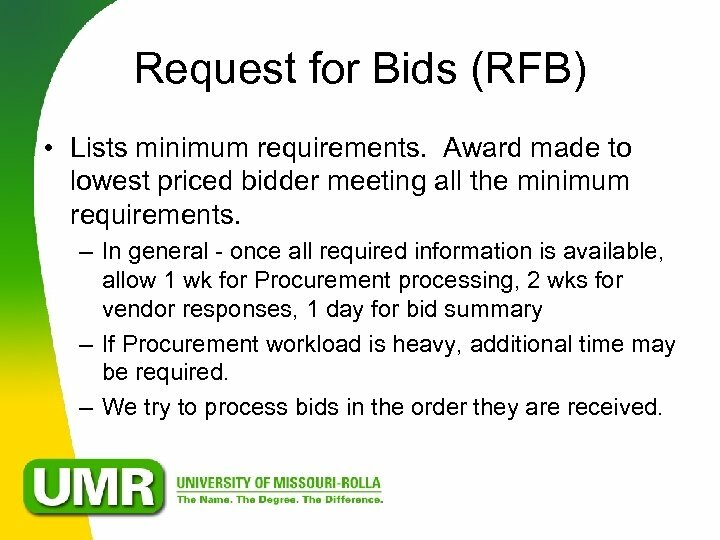 • Procurement issues a bid request for 3 days to 1 month, depending on item/service, dollar amount, and time respondents need to respond to requirements. 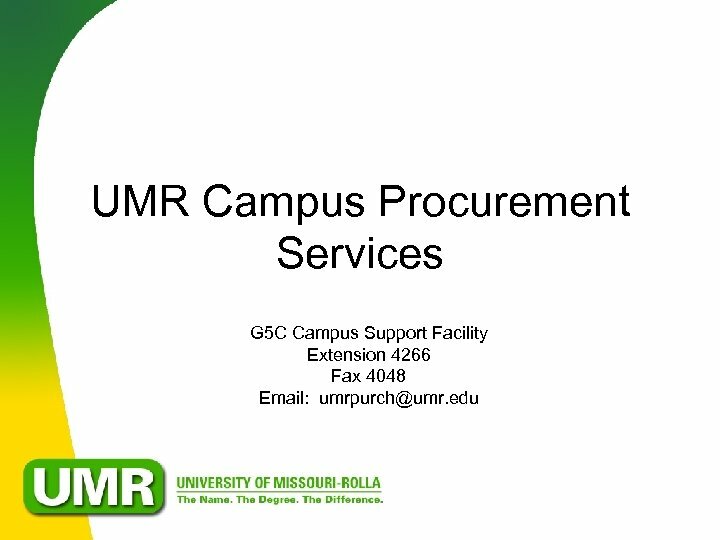 • Responses received by Procurement, Procurement types a summary, sends summary and responses to requesting department. 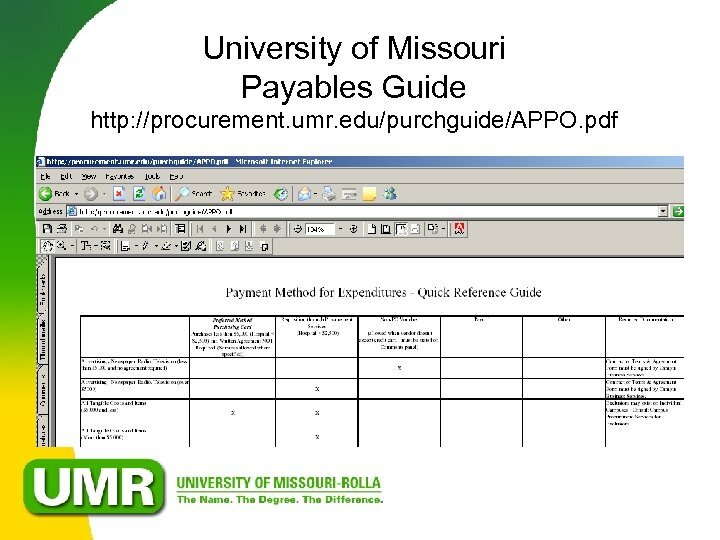 • Requesting department reviews responses, finds lowest priced bidder meeting specifications, states why bidders not selected but lower priced do not meet specifications, signs summary, and returns summary and bid responses to Procurement. 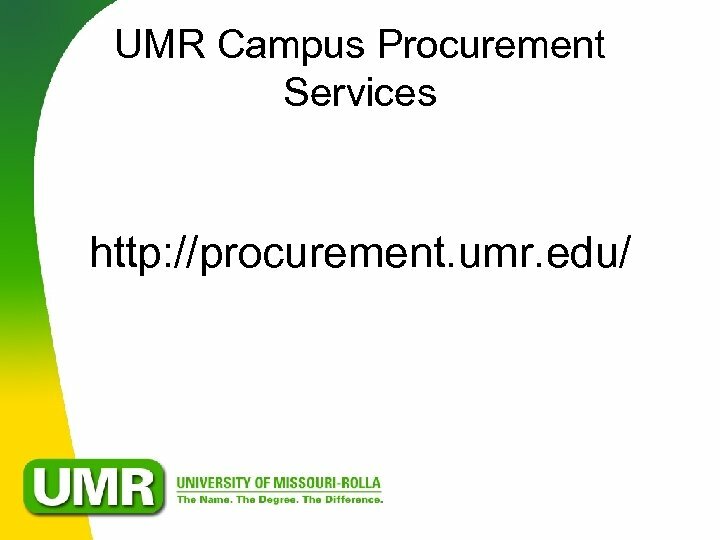 • Procurement issues award by purchase order, contract, or combination. 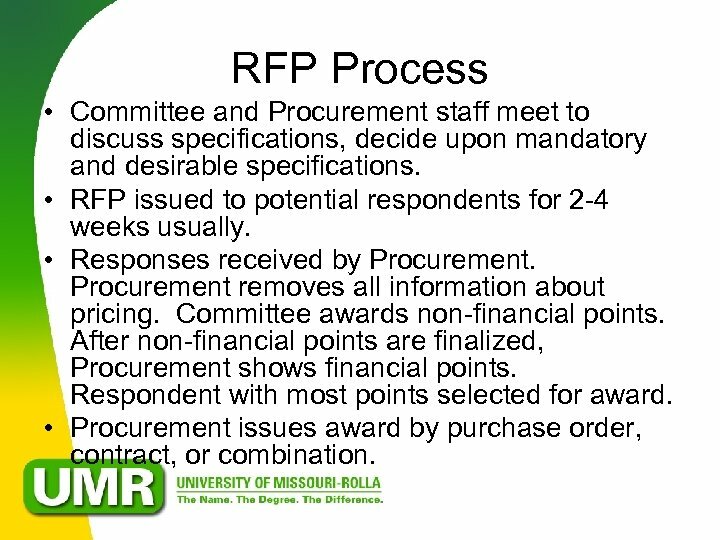 RFP Process • Committee and Procurement staff meet to discuss specifications, decide upon mandatory and desirable specifications. • RFP issued to potential respondents for 2 -4 weeks usually. 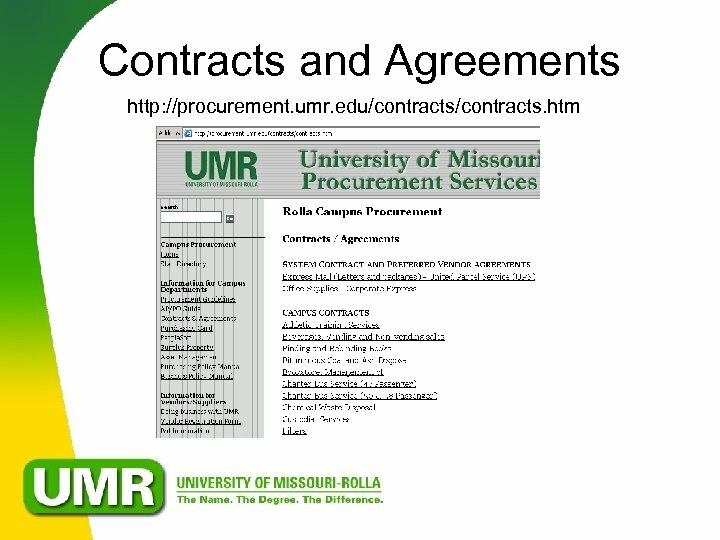 • Responses received by Procurement removes all information about pricing. Committee awards non-financial points. After non-financial points are finalized, Procurement shows financial points. Respondent with most points selected for award. • Procurement issues award by purchase order, contract, or combination. 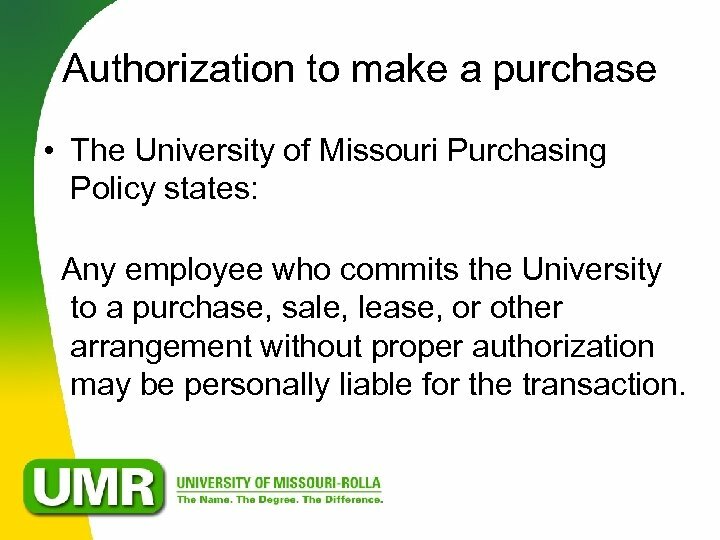 Authorization to make a purchase • The University of Missouri Purchasing Policy states: Any employee who commits the University to a purchase, sale, lease, or other arrangement without proper authorization may be personally liable for the transaction. 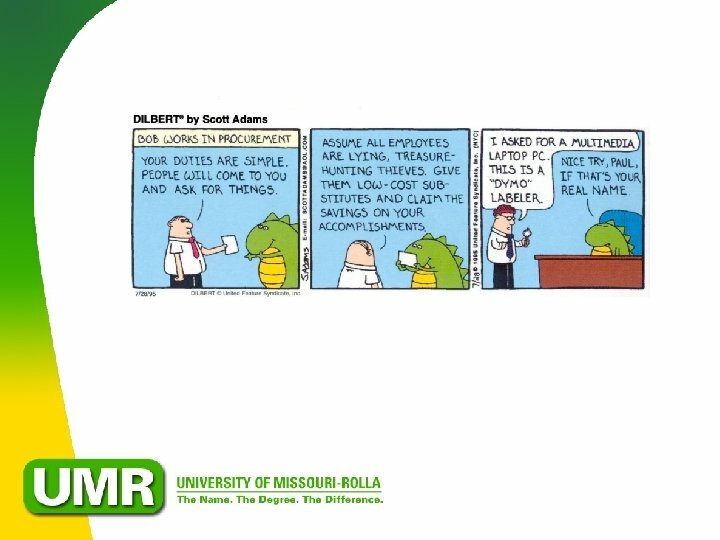 How do I get a purchase order? • Department enters and approves a requisition listing detailed information. – Requisitions are created in People. Soft and are usually created by a support staff member. 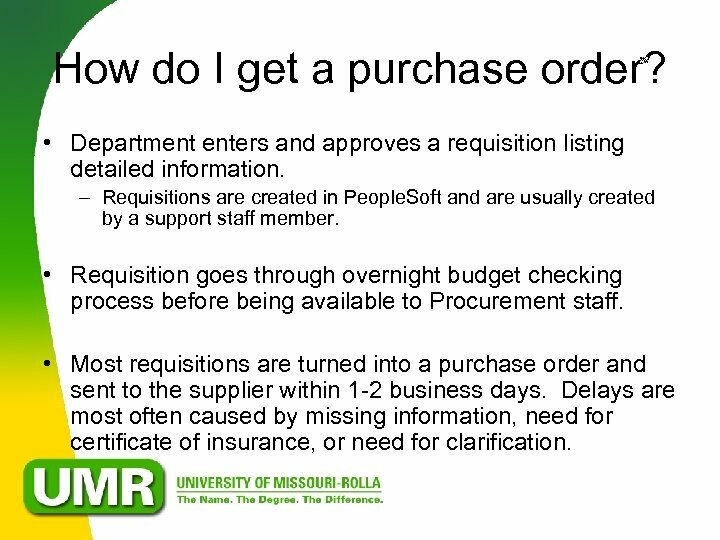 • Requisition goes through overnight budget checking process before being available to Procurement staff. • Most requisitions are turned into a purchase order and sent to the supplier within 1 -2 business days. Delays are most often caused by missing information, need for certificate of insurance, or need for clarification. 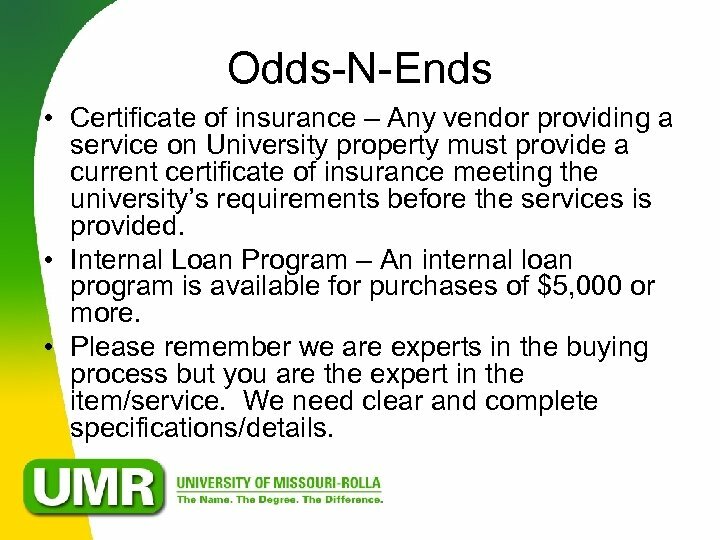 Odds-N-Ends • Certificate of insurance – Any vendor providing a service on University property must provide a current certificate of insurance meeting the university’s requirements before the services is provided. • Internal Loan Program – An internal loan program is available for purchases of $5, 000 or more. • Please remember we are experts in the buying process but you are the expert in the item/service. We need clear and complete specifications/details. Tips for getting WHAT you need and WHEN you need it. • Don’t wait until the last minute. 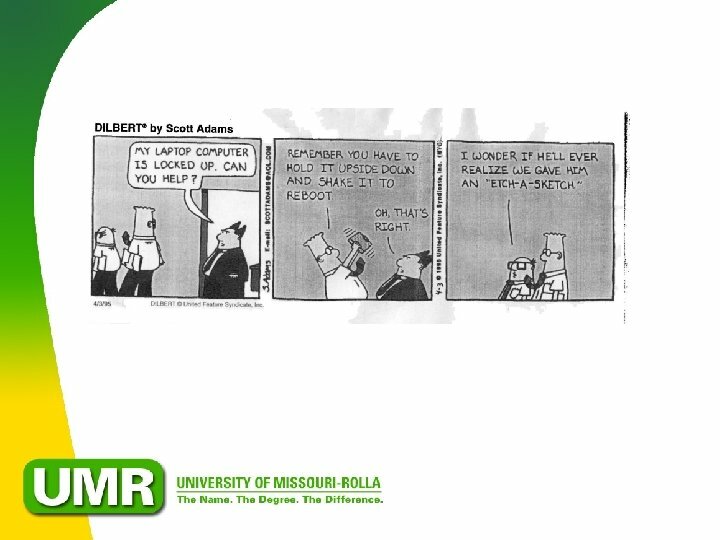 “Lack of planning on your part does not constitute an emergency on my part. ” Unknown • Involve us early. • If you are uncertain – ASK. 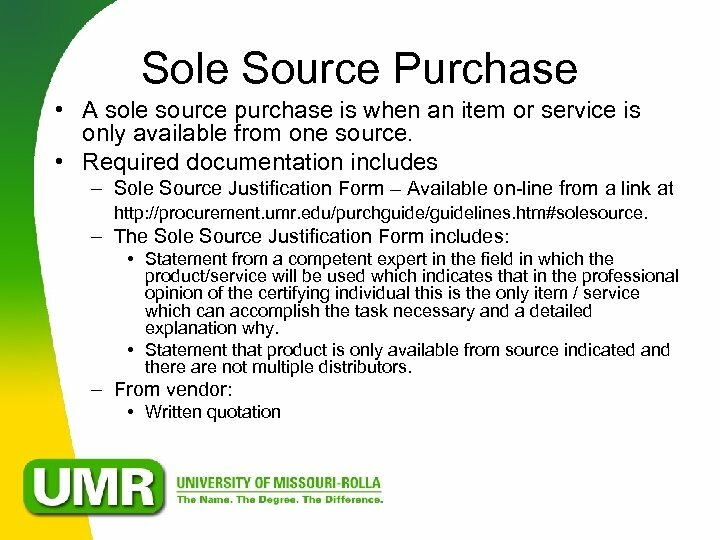 • Provide detailed information – the purchase order / bid is a legal document. 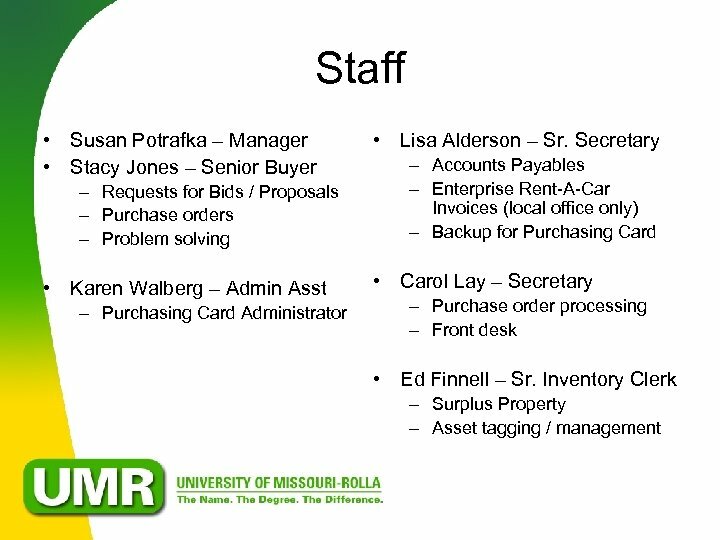 • Get to know YOUR Procurement staff.